Background: Anorexia of the Female Adolescent is the most important and most dangerous kind of anorexia. This anorexia manifests itself precisely after menarche, the first step in a young woman’s developing femininity and fertility. This kind of anorexia begins within a limited time frame after menarche and is characterized by weight loss and loss of the menstrual cycle for more than three months. There can also be relapses of this kind of anorexia over the course of life. 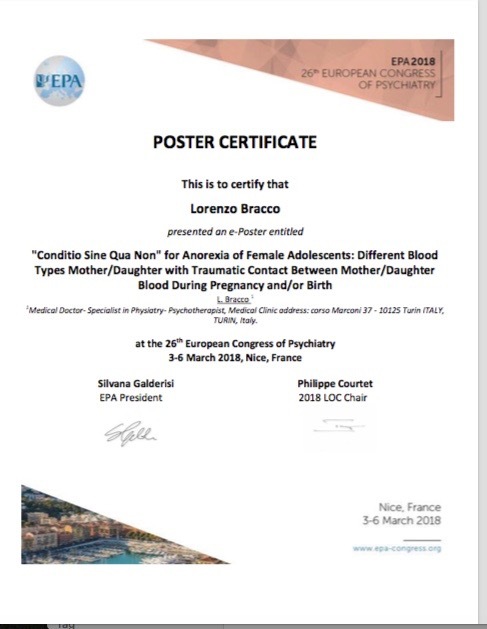 Introduction: My new theory is that Anorexia of the Female Adolescent, in addition to psychological causes, needs a conditio sine qua non: “Different mother/daughter blood types (0, A, B, AB) and traumatic contact between the two blood types during pregnancy and/or birth”.These two dynamics together create the development of female adolescent anorexia. Objectives: To reduce the mortality rate and the consequences of anorexia by providing a theory that allows us to have an early or even predictive diagnosis. Methods: 25 years ago, in a purely casual way, I came upon the blood type difference between an anorexic patient and her mother. Pregnancy had been with placental detachment and birth was traumatic, which was the presumed cause of mother/daughter blood contact. From that day on, I regularly checked, in the cases of anorexia of female adolescents, the blood types of the anorexic and her mother. Results: In my collection of data (more than 100 cases in 25 years): only the girls who have a different blood type (0, A, B, AB) from the mother are anorexic and from their details I determined a mother/daughter blood contact. There are no exceptions in my data. Conclusions: Anorexia of the Female Adolescent recognizes that there are some psychological causes, but also requires the “conditio sine qua non” described above. Recognizing this condition allows an early diagnosis, a predictive hypothesis and a new understanding and even a reframing of the mother/daughter relationship, that is not primarily about emotional conflict but is simply the reflection of a relationship disturbed by an immunological alarm. Bracco, L. (2014) ANOREXIA:The Real Causes: Blood Types and Trauma. Amazon.